Lexus showed off a single image of the brand new 2013 LS yesterday as a way to generate excitement for the full unveil of the latest generation LS luxo-liner, scheduled for 11:30 Eastern Time Monday on Facebook. Firm details from Lexus are basically nonexistant, but it's practically a given that the fifth generation of the car that introduced Lexus to the world will continue with some version of the current 4.6-liter V8. Most likely, there will be a hybrid in the mix. 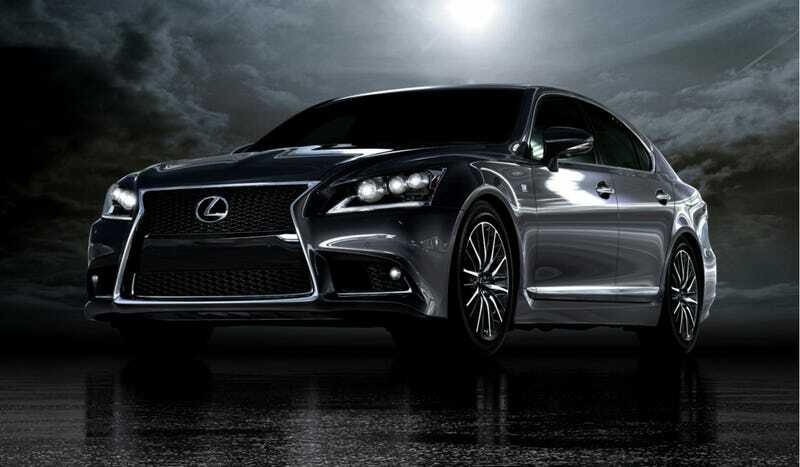 The image released by Lexus is of the LS F Sport, a new version along the lines of the GS F Sport. That means this car has more aggressive styling and suspension bits than the standard version. The new LS also looks a bit like an enlarged version of the 2013 GS, complete with the now-ubiquitous spindle grille that's spread to the whole Lexus lineup like Bieber Fever at a middle school. If the GS is anything to go on, the LS styling will be adventurous for a Lexus, but the Audi A8 and Jaguar XJ will probably still be the lookers in the large luxury sedan segment. Full details will be shared Monday, so come back then to see how far forward Lexus moved its flagship against the European competition.